Welcome to kateritv.com. Through the programs presented on this channel, you will be getting to know how Canada’s Catholic Aboriginal communities are engaged in a healing process that will bridge a difficult past with a far brighter future, how they define that process, how they draw on ancient traditions and their modern Catholic faith to make it happen. 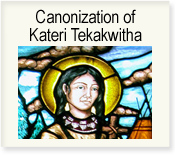 The site, named after Saint Kateri Tekakwitha, is dedicated to her and to all Canadian Aboriginal Catholics who celebrate her canonization (October 21, 2012) and who look to her as a model of how their traditions can be combined with the Good News of their Catholic faith and how this combination can end up enriching the Church in North America. For Salt and Light’s Fr. 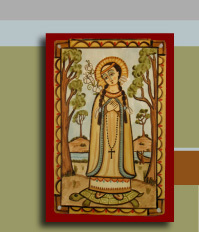 Tom Rosica’s video on Saint Kateri, click here. KateriTV’s inaugural offering of reflections on Medicine Wheel spirituality is a co-production of the Building Bridges Project (an initiative of the Standing Committee on Aboriginal Affairs, Assembly of Western Catholic Bishops) and Villagers Media Productions. Content for the series was under the direction of Sr. Eva Solomon CSJ, executive director of Building Bridges, and Archbishop Sylvain Lavoie, Archbishop of Keewatin The Pas 2005-12, founding chairperson of the Standing Committee on Aboriginal Affairs, Assembly of Western Catholic Bishops. Filmed in cooperation with Newman Theological College, Edmonton and on-location at “Directions in Aboriginal Ministry,” a four-day annual conference at the Star of the North Retreat Centre, Saint Albert, Alberta, this series is based on interviews with key leadership, both Aboriginal and non-Aboriginal, in today’s Church. This could be the beginning of your journey into an important part of Canadian Catholic history and life today. Just press on one of the programs, watch it, have a look at the study guide and go from there. We would love to hear from you your feedback and any adventures or encounters this web site leads you to. KateriTV was financially supported by the following Roman Catholic institutions: Catholic Missions in Canada, Sisters of Service, School Sisters of Notre Dame, Congregation of Notre Dame, Religious Sisters of the Sacred Heart, Sisters of the Presentation of the Blessed Virgin Mary (Newfoundland), Sisters of Mercy of Newfoundland, Spiritans of English Canada, Grey Sisters of the Immaculate Conception (Pembroke). Archdioceses/ Dioceses: Churchill-Hudson Bay, Hamilton, London, Prince Albert, Saint Catherines, St. Boniface.